I was at the library a couple of weeks ago and saw Leafs '65, The Lost Toronto Maple Leafs Photographs sitting on a shelf and knew I had to have a read. In the 60s as a young boy I breathed, ate and slept hockey, hoping that one day, I would become a Toronto Maple Leaf. You guessed it, I didn't and, in fact, don't even watch hockey any more. In 2006, Lewis Parker, an artist and illustrator, was disposing of some of his belongings from years before in preparation of a move. He and his friend Dennis Patchett were going through boxes, and anything that was deemed not worth saving was relegated to a roaring fire. As Lewis passed him box after box, Dennis would pitch them in the blaze, one after the other. Suddenly, he caught the words on a file folder: "Leafs 1965." Inside were photo negatives and contact sheets. "I think we should keep these," said Dennis. 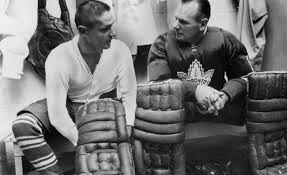 In the fall of 1965, artist Lewis Parker received a call from Maclean's magazine for a possible gig: accompanying a reporter to Peterborough to cover the Toronto Maple Leafs's preseason training camp. Lewis would spend some time with the team, and shoot stills that would run alongside the magazine piece. Though it was a career departure, he agreed, and the result of his time spent with the Stanley Cup-winning team during the training camp before their last Cup win are within these pages: beautiful, visually arresting photography that captures the comraderie and purity of a time in hockey and Canadian history not seen since. With complete, unfettered access to the team -- many of the players from remote farms in the country, and none with agents -- and GM Punch Imlach, Lewis Parker's photos (which, once the piece was cancelled by Maclean's, were never used) reflect a wistful moment in time before the hockey league changed forever. 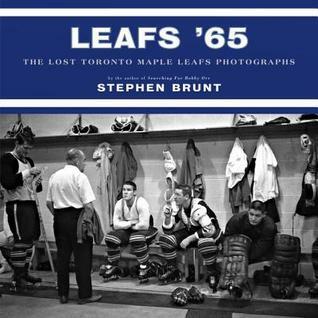 Accompanied by acclaimed writer Stephen Brunt's essay on the '65 training camp -- based on interviews with team members -- Leafs '65 is the ultimate tribute to the Stanley Cup-winning Toronto Maple Leafs, to a forgotten era of hockey, and to a moment in Canadian history that will resonate with any reader. I really enjoyed not only the pictures in the book but also Stephen Brunt's writing of that era of hockey. There are many serious and humorous stories about that training camp, the Leaf situation at the time. They had won the Stanley Cup three years in a row before losing to the Montreal Canadiens in the 1945-65 season. 4 games to 2. Punch Imlach said the leafs were only loaning out the Stanley Cup to the Canadiens for the season. Imlach was a hard man to deal with. Not only was he the coach, but also the general manager in charge of signing the players. The book deals much with the negotiations between Punch, Bobby Baun (my all time favorite defenceman), and Carl Brewer. One funny story that came out is a classic well-known one. Bobby Baun knew how to negotiate. Gordie Howe did not. Players never ever discussed salaries with each other so didn't know where the bar was set. The Detroit Red Wings manager, Jack Adams, always told Gordie Howe he was the highest paid player in the league and not to tell other players how much he made as "It would make the other players jealous." When Baun became a Red Wing in the 1968-69 season, Baun told Howe, who was making $45,000 a season at that time (before the big money contracts that came a few years later) that he was making $67,000, $22,000 more than Howe!That was probably the point where players decided to start sharing information and form a union. The pictures are excellent, of course. It's fun to see candid shots of some of my favourite players but the two photos I enjoyed most don't even have a player in them. One is just a clutter of Leafs long johns hung up to dry. The other is of the hockey stick rake. Every stick was a CCM and not one had a curved blade. It was a different era of hockey and this book does a great job of telling the story. It would be enjoyed by any hockey fan.